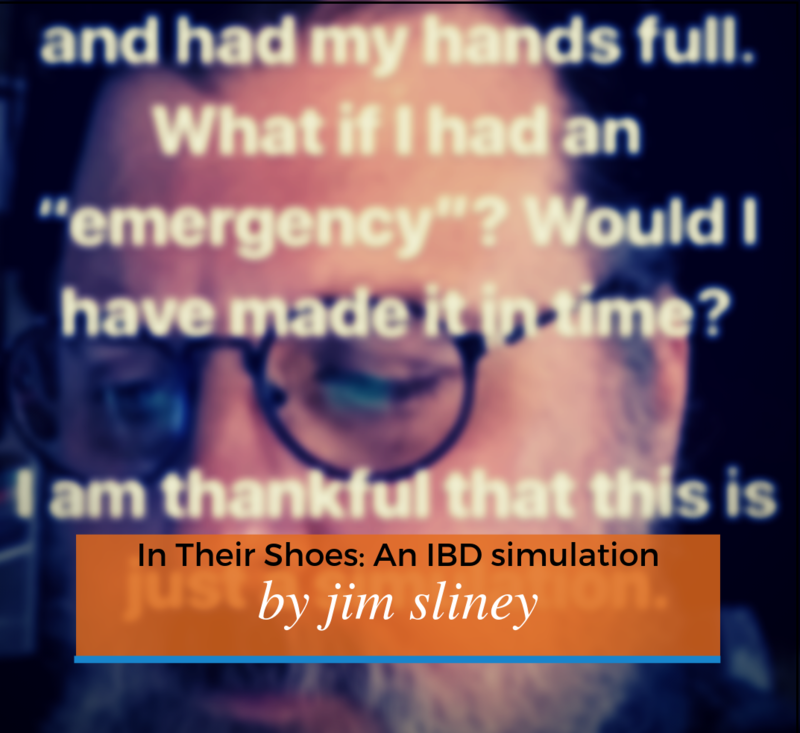 Writer and Advocate Jim Sliney Jr of Patients Rising takes part in a simulation for Inflammatory Bowel Disease and shares what he learned. I woke up on Tuesday November 27th just like any other weekday. Got out of bed, showered, drove my wife to work, drove back home to my office. Except today I had Inflammatory Bowel Disease. In Their Shoes is a program that simulates Inflammatory Bowel Disease. To be clear, you don’t actually get temporary IBD, that would be every kind of wrong. Instead, a parcel of materials combined with a app gives you alerts and notifications to your smart phone during a 3-hour simulation. 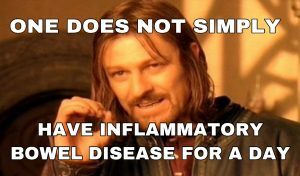 One does not simply have Inflammatory Bowel Disease for a day, but in this case I would. I had agreed to do this with no small amount of enthusiasm (if you think that’s odd, I can’t argue that) because, as a patient advocate I am always looking for ways to build empathy with the folks I work with. I thought it was brilliant. Still do. So, while my day started normally enough, it soon veered off course. Before I got to my home office, I pulled off the road, stopped the car, and recorded my feelings Live on Twitter, Instagram and Facebook. I was feeling anxiety. The program should have started by now. At any second I was going to get notified of my first event. Where was the notification? What was it going to say? Was I going to have to pull up to a restaurant and ask to use their bathroom? It turns out, there was a delay in starting the program on the administrative side. While I was pulled over, I checked my email and there was a notice. ‘Program pushed back one hour’. While this was not at all part of the simulation, it couldn’t have been more effective. I was anxious because every moment that ticked by I felt like I had one less moment before something unpleasant was about to happen. People with chronic illnesses who get flare-ups have expressed that very same concern to me many times and say it is a great source of anxiety. FACT: did you know that Inflammatory Bowel Disease (IBD) is not one thing? IBD includes conditions like Crohn’s Disease, Colitis and Ulcerative Colitis. What they all begin with is an inflammation of the walls of the intestine, thus IBD. IBD patients have to know where the nearest bathroom is at all times. That means on-the-road, in a plane, at a party, in the office – everywhere. TIP from a New Yawka: walk into any hotel like you’re staying there and you’ll be able to use their lobby bathrooms without a word. I’ve peed in some of the finest hotels in the world. The embarrassment I felt about having to take a picture of my less-than-sparkling bathroom is nothing compared to having to use a shared bathroom, say, at your office. There are no secrets in a shared bathroom. Other than that, I was free to eat smaller more frequent meals at my discretion. CHALLENGE: Friends, think of your ten favorite foods. Every time a food falls into any of those above categories, eliminate them. What did you have left? I made myself a soft-boiled egg. Then I broke the rules and instinctively fried up some potato and onion in butter – so, they wouldn’t be raw, but they’d be fried and fatty. And I added salt and pepper (spicy?) because every cooking show ever-made tells you to. I soon learned that the consequences of my butter-fried vegetables and pepper were pain and cramping and a relatively long visit to the bathroom. All I had to do in the simulator was play Solitaire for ten minutes, but an IBD patient would be in real pain. FACT: To be clear, Irritable Bowel Syndrome (IBS) is not the same thing as Inflammatory Bowel Disease (IBD). I slipped and said the wrong term more than once. Major difference? IBS does not cause bleeding or chronic inflammation. Confession: my father has advanced Alzheimer’s disease. A common problem with Alzheimer’s patients is incontinence. I guess I’m saying I’m familiar with adult diapers. Well, one option for IBD patients is to wear some kind of diaper. I mean, we’ve all been there at least once, right? You’ve got to go – you’ve GOT to. Non-negotiable. Count back from 20 as fast as you can. It was too late before you reached 7. And we all know what a shart is, right? 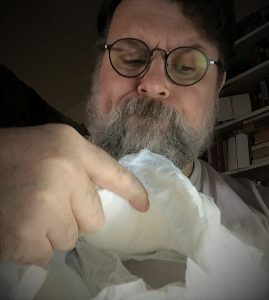 If you think wearing a diaper is embarrassing, humiliating or distressing I’m sure you can imagine the consequences of not wearing one. What would you choose? Sometimes sh*t happens. It’s smart to have a change of clothes with you just in case. Even if you are already wearing a secondary protective garment. Trips to the bathroom can leave behind an odor. Keep a small deodorizing spray with you to cover your tracks. My simulation was only 3-hours long (not including that first non-hour where I was just waiting for the hammer to fall) and I got to walk away from it when I was done. IBD patients can’t do that. 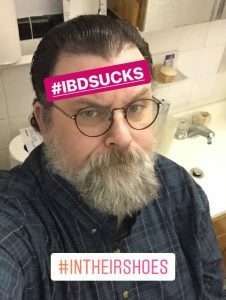 So, when you are advocating for, or working with IBD patients, think about what it would be like to live in their shoes for a little while. That just got a little easier to do in the state of Massachusetts because Governor Charles D. Baker just proclaimed December 1 – 7 to be Inflammatory Bowel Disease Awareness Week. Kudos Governor! Understanding the plight of those who suffer can turn sympathy into empathy and help you represent the needs of the community more effectively and make you a better advocate. 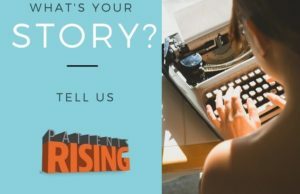 Jim Sliney Jr. is a Registered Medical Assistant and a Columbia University trained Writer/Editor who creates education and advocacy materials for patient support groups. He has worked closely with several rare disease communities. 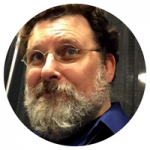 Jim also coordinates the patient content for PatientsRising and collaborates with other writers to hone their craft. He’s a native New Yorker where he lives with his wife and all their cats.